A quick look back at the second week of March in Philly marked by protest and indications of change to controversial law enforcement practices. 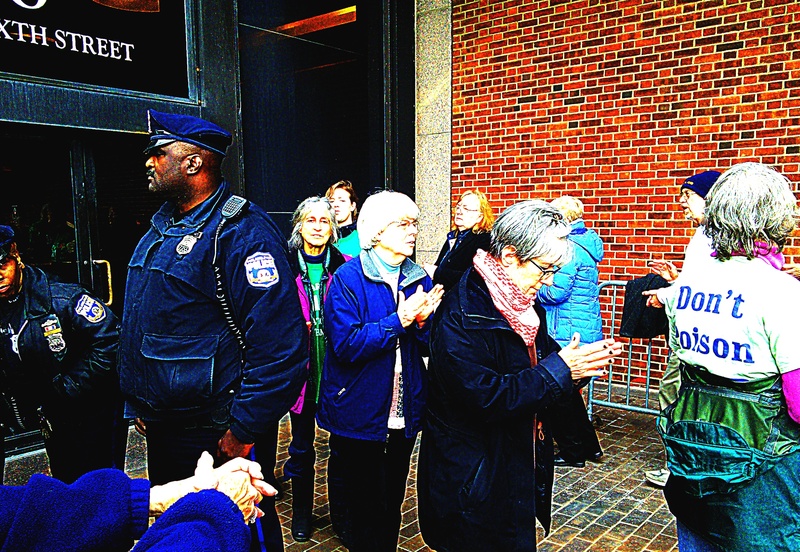 The week of the 10th-16 began with a false Spring and a blockade of the federal building at 6th and Market by environmental activists, demanding that the State Department, which has an office in the building, reject the Keystone XL pipeline. (Phawker, 24 Philly Keystone Pipeline Protesters Arrested). Woman arrested Monday at the Federal building, demanding the State Department reject the proposed last leg of the Keystone XL Pipeline. We spoke with Jonathan Sykes, an organizer of the demonstration, about who was there, why, and those who came knowing they faced arrest. Park Ranger Police from nearby historic sites brought barricades used for crowd control to the courthouse and erected them by the north door. Demonstrators marching, “sweeping out corruption,” around a sculpture in the courtyard of the courthouse. Protesters blocking the building’s north door sing and dance as they await law enforcement to conduct the next round of arrests. Also on Monday, the Philadelphia City Council Committee on Law and Government heard testimony regarding a bill that will go to the full council this Thursday, and if passed would end the current Philly Police practice of mandatory arrest for possession of small amounts of marijuana. (Philly Weekly, Pot takes another step toward decriminalization in Philly). Wednesday, demonstrators gathered at City Hall calling on the city and police department to end cooperation with Immigration and Customs Enforcement no longer hold those not charged with serious offenses pending ICE investigation into the arrestee’s residency status. A hearing of the City Council Public Safety Committee heard from over two dozen witnesses regarding the issue. The U.S. Constitution guarantees the right not to be imprisoned without probable cause and due process of law. Yet ICE routinely asks local officials to hold people in jail, beyond the time when they should be released, based on nothing more than ICE’s interest in investigating whether they might be subject to deportation. To deprive a person of liberty solely because the government seeks to investigate that person, without requiring any judicial determination of probable cause and without affording any opportunity to challenge the basis for the detention, violates the Constitution and offends fundamental American principles of justice. ICE detainers also serve as the lynchpin of federal immigration enforcement programs like Secure Communities (“S-Comm”) and the Criminal Alien Program (“CAP”), which rely on state and local police to do ICE’s legwork, inviting police officers to engage in unconstitutional racial profiling and to treat people perceived to be “foreign” differently. In short, when local law enforcement agencies choose to imprison people pursuant to ICE detainers, this jeopardizes the rights and safety of everyone in the community—including citizens as well as immigrants. An executive order partially ending ICE cooperation has reportedly been drafted by the Mayor.